Bangalore: The fashionista dream has been overtaken by recessionista realities around the world—and now in India as well. For example, some 10 years after its first launch in India and four years after a re-launch, semi-formal brand Dockers is again on its way out. US-based Dockers, primarily a wrinkle-free cotton pants and khakhis line for men, continues to expand worldwide, but in India, its mother brand Levi Strauss has decided to focus on jeans. Of the 30-odd Dockers stores in the local market, at least 25 have been closed and the remaining are selling their stock. Any leftover inventory will be sold through factory outlets of Levi Strauss. The average selling price of a pair of Dockers trousers in India was Rs2,000-2,500. Over the past few months, several foreign apparel brands in India have either decided to exit the market or are undergoing a major overhaul. Apparel exporters who had entered the domestic market over the past four-five years riding a retail boom are reworking their business models; local retailers are revamping their pricing and sales strategies. Mohan and Vijay Murjani, among the first to bring luxury brands such as Bottega Veneta, Jimmy Choo and Gucci into India, have exited from the first two and are in the process of a slow exit from the Italian Gucci, which has two stores in India. “India has a long way to go to make luxury retail sustainable and so we will focus on premium brands now," said Vijay Murjani, managing director of Brand Marketing India Pvt. Ltd, which also brought casual designer brand Tommy Hilfiger to India in 2004. 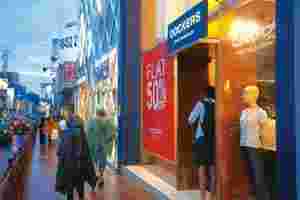 Going ahead, Brand Marketing wants to selectively open stand-alone stores for both fashion retail chains FCUK, or French Connection UK, and Calvin Klein in cities such as Mumbai, though it does not want to bring in any other brand into India in the near future. As consumers tightened spending and traded down due to the global economic meltdown, luxury retail took a beating worldwide, particularly in nascent markets such as India. “The forecast is that by 2010, the luxury retail space will make a comeback, but the end-of-year festive season will be a litmus test to see if global sales pick up," said Salomi Nangia, vice-president of KSA Technopak Advisors Pvt. Ltd, a retail consultancy. With the harsh impact of the downturn, the retail euphoria is over in emerging markets such as India and many foreign brands are now rolling back their ventures, said Pranshu Mittal, a retail analyst with Centrum Broking Pvt. Ltd.
“While steep pricing was an issue, these foreign brands didn’t meet their sales targets. Not many Indian buyers have an appetite for these brands and the ones who have, buy them overseas," said Mittal. All the 12 stand-alone stores of GAS, a premium lifestyle brand from Italy, have been shuttered in the past few months. But Mumbai-based apparel retailer Raymond Ltd, which had signed a 50:50 joint venture (JV) with Italy’s Grotto SpA in end-2006 for the brand, said the JV still stands. A Raymond spokesman, who cannot be named because of company policy, said GAS is undergoing a major restructuring. “We are still in the process of evaluating various alternatives about GAS. The economic situation is still not yet out of the woods," a senior GAS official in India said by email. He, too, didn’t want to be named. Retail analysts blame the high pricing of the GAS brand, which sells a basic pair of jeans for at least Rs3,500. Earlier this year, French premium lingerie brand Etam parted ways with Future Group with which it had a 50:50 JV. More recently, Dubai-based Landmark Group, which has brought in several foreign brands into India, rolled back Springfield, a European casual wear brand, VNC, a women’s footwear and accessories brand, and Italian sportswear Kappa. “The two crucial parameters for foreign brands to survive are pricing and brand awareness," said Kabir Lumba, executive director of Lifestyle International Pvt. Ltd, the retail chain of stores run by the group. While Springfield and VNC suffered primarily because of their steep pricing, the firm is trying to make its other unisex fashion wear brand Bossini work. “We are sourcing much of the stuff locally for Bossini so that we can price it sharply and attractively," said Lumba. A Springfield T-shirt typically costs at least Rs1,500; a Bossini T-shirt costs about Rs500. In the first year of its launch in October 2007, Planet Retail Holdings Pvt. Ltd, a leading lifestyle retailer, opened three outlets of Debenhams, a British retail chain, and has no plan to open more. The company, which also sells Guess, a premium lifestyle brand, in India, has only 20 sales points in the country. “A number of stores that were opened in malls were relevant three-four years ago, but are no longer and have had to be shuttered," said Sameer Prasad, chief executive of Planet Retail. “In a developing market like India, this is not unexpected."